Oprah Winfrey | Monsanto will Take You to Lunch! Over the years, the Oprah Winfrey Network has encouraged it’s viewers / readers to “Live their Best Life” through creating healthy relationships and organic food choices. And for those teachings, I am very grateful. However, last month, Maui Organic Farm Owner, Oprah Winfrey became “a horse of a different color.” The Oprah Winfrey Magazine allowed a full page Monsanto AD in it’s magazine. And although over 10,000 individuals are petitioning against the Monsanto AD and demanding an explanation; the Oprah Winfrey Network has produced no press release on the “Oprah and Monsanto” deal. And major TV stations are sitting SILENT [probably afraid of the wrath of Oprah’s 2.9 Billion Dollar Empire]. 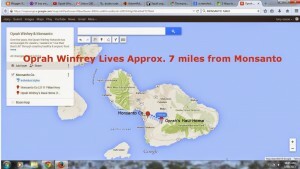 Oprah has acquired a dozen homes and scores of outbuildings and farm-related structures in Hawaii. Oprah’s Maui home, Thompson Ranch is located approximately 7 miles from the 300 Acre Monsanto Plant Breeding Research Facility. Oprah and Monsanto Co.are neighbors. 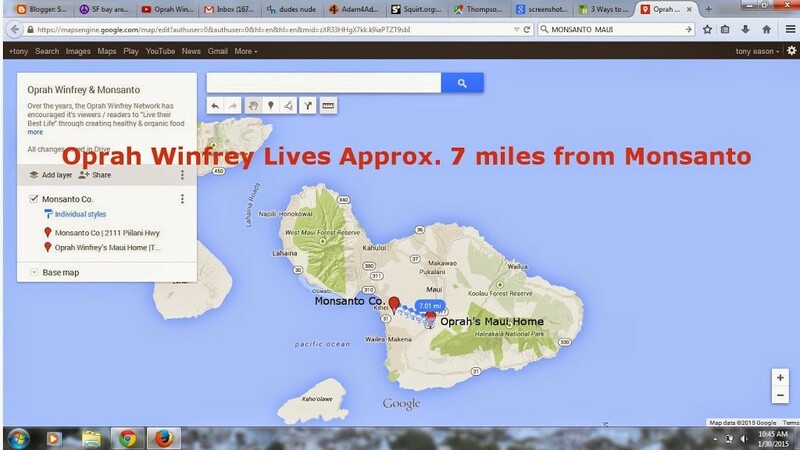 Question: Did Monsanto “gift” Oprah the Thompson Ranch in Maui? Question: Is Oprah Winfrey BROKE?